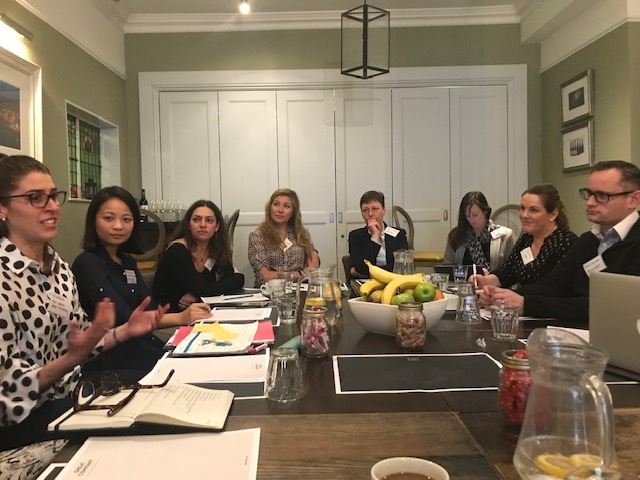 On Thursday 21 March Ardea International convened a roundtable featuring four speakers from across business and civil society. We asked them to share what they and their organisations are doing to end modern slavery and what recommendations they have for other sectors. Please find a summary of the discussion points below. Eleanor Spencer and Red Godfrey-Sagoo from the Sophie Hayes Foundation spoke powerfully about Day 46, an employability programme empowering women survivors to make independent decisions about their future. Workshops, individual coaching, CV and interview preparation is offered by the Day 46 community whose ethos is never to end a relationship with a participant. This programme gives many women survivors of trafficking, who have often lived a life under patriarchal rule, a route to independence. Some survivors won’t win the right to remain in the UK, but if they return to their home country they return with a skill, maybe as a hairdresser. They don’t return as victims of human trafficking. Fifty percent of women are re-trafficked because they have no independence. Out of 98 survivors who attended workshops, 26 women recently moved into education. Human trafficking doesn’t just affect young women and girls, the average age of women on the Day 46 programme is 45 years old. Along with an exciting new move to Brighton, The Sophie Hayes Foundation is also piloting a men’s programme to assist male victims of trafficking and modern slavery. “Modern slavery is endemic across all ages, all genders and all sectors”. Det. Sgt. Sophie McGarel from East Sussex police spoke about its Discovery team, dedicated to fighting modern slavery and human trafficking in the area through a multi-agency partnership. Sophie emphasised the need to look at human trafficking from a victim-perspective to understand the low reporting and frustratingly low prosecution rates for modern slavery in the UK. Many victims have been disempowered for decades and from a crime-perspective it’s important to understand that human trafficking is another form of organised crime. Historically, victims have been unwilling to talk to police because they are traditionally seen as only having roles as law enforcement and prosecution. The police have a particular reputation with both the public and victims but contrary to this Sophie’s team are also passionate about providing a full victim support service. Like Eleanor and Red, Sophie stressed the variety of demographics encountered by her team, and described some of the more practical steps they can take to equip victims who have been identified with phones and teaching them how to call 999. She also reiterated the importance of working alongside people who share her passion for tackling human trafficking and saving more victims. Sophie spoke transparently about how important it is for police forces to be exposed to victims’ life stories in order to learn from them so that they maintain a victim-oriented response whilst also targeting those who are responsible. It’s not just footballers who are employed to shoot goals, Rose and her team at Brighton and Hove Albion FC are setting measurable goals to tackle slavery, if found, in its supply chains. The club hopes to set an example to other Premier League clubs, many of whom, like BHAFC, are at the start of their modern slavery journey. Rose spoke about the start of her journey with the football club, its “ethical and humble” ownership and the strong values held by the club’s board who have seen the club’s rise to Premier League status. But with such status, brings responsibility, which Rose is more than stepping up to now that the club turns a profit of more than £36 million a year (requiring it to publish a modern slavery statement). 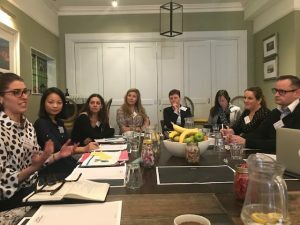 Rose is championing the club’s role within the community it serves, offering senior staff a master-class in spotting the signs of modern slavery and she has worked closely with Ardea International to understand the landscape of business and human rights and their own role in combatting modern slavery. For Rose, it is important that they take the opportunity to lead on modern slavery in football, being realistic about the promises they make in their modern slavery statement but also thinking creatively about how they can use football as a vehicle to convey messages and raise awareness of the issue amongst the 30,000 people who regularly attend matches at the Amex Stadium as well as their wider fan base, key stake-holders and community participants. Isobel, from Ardea International, spoke about her MA research into how businesses can be encouraged to engage with human rights and modern slavery. 15 million people worldwide are exploited in the private sector yet efforts to curb companies’ negative impacts with mandatory reporting legislation have failed to effect meaningful change. A multitude of voluntary initiatives encourage businesses to join industry-specific memberships or certification schemes, yet these too can fall short of making a deep impact. NGOs often use naming-and-shaming tactics to force companies to alter behaviour; some companies will disengage if they feel they cannot trust NGOs or that an admission of modern slavery could be held against them. As an alternative, Isobel outlined how elements of a business association model can be useful to reframe the narrative around human rights norms and how they relate to business, and to foster transparent collaboration. By couching modern slavery within a business vernacular of “mismanagement”, business associations challenge companies to think innovatively to offset the cost of anti-slavery engagement rather than being afraid to impact their bottom line. Breaking down the barriers of suspicion that exist between the private, public and third sectors can establish true collaboration and form the foundation of meaningful and proactive business engagement.